Sometimes when I cruise through the grocery store, it seems that a product manufacturer has been inside my head. This was evidenced recently as I was looking for a particular flavor of bottled salad dressing. To be honest, I get very frustrated when I am confronted with large product categories, where a packaging style or color palette becomes a norm and sooner or later everything looks the same – like salad dressings. So I was pleasantly surprised when my eye caught the new pouch format for a small, two-serving size package of Kraft salad dressing. 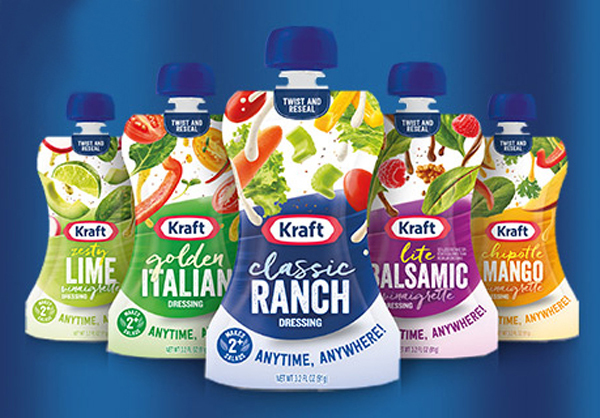 Kraft has taken a risk; breaking the bottled salad dressing paradigm by using a pouch similar to what is being successfully used for baby food packaging. Now I no longer have to fill my refrigerator shelves with half-used bottles of dressing that may take months (or years) to use up, and better yet, the convenient new pouch allows me to throw a package in with lunch – without having to worry about finding a leaky mess when I get to work. To me, this package succeeds on many levels. The structural design meets the needs of consumers by being size appropriate, easy to use, and highly transportable. The graphic design is based on a grid that provides continuity across five flavor variations, yet allows for controlled flexibility around a consistent brand masthead – keeping Kraft front and center in the design. Using consistent fonts and organized messaging makes it easy for the consumer to distinguish between flavor and style variations. The thrust of the design is white, creating a clean backdrop for photo realistic illustrations of salad combinations or applications of the various flavors – each being tied to a color that further reinforces the association between the flavor and product use. The packaging colors are very effective in drawing attention to the product, even when positioned on the top shelf. If I could change anything about the package, it would be the blue twist off caps. Having gone so far to create an innovative approach to packaging, it would be nice to tailor the cap color to the code color of each dressing package. It won’t be long before people have learned or associated the color on the package with a particular flavor or style, and colored caps would hasten that recall. I hope that Kraft has set a new norm for this category and that we will see more pouches on shelf. Well done, and congratulations – this is packaging that works and works well.